It’s nothing personal, but this fern is giving you the finger. I haven’t seen this fern often–this one was spotted on the Steep Ravine trail on Mt. Tamalpais. 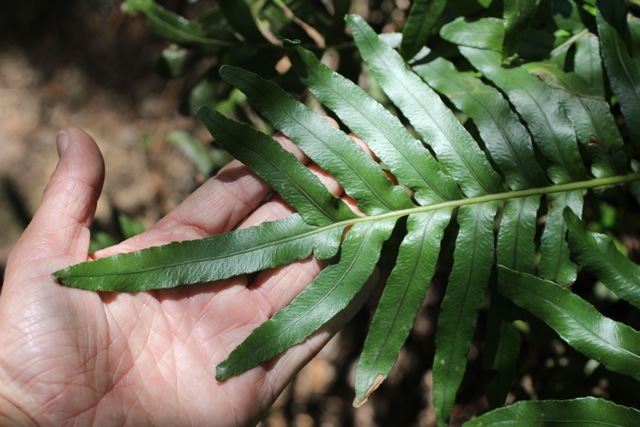 Leathery polypody (also known as leather fern or leather leaf fern) can grow in a variety of habitats, including coastal strand, coastal meadows, and redwood forest. According to Plants of the Pacific Northwest Coast, it’s rarely found far from salt spray.